The pre-war one thousand-year-old territory of Hungary, bounded by the Carpathian Mountains, as an evergreen wreath. (1) Northwest Carpathian Mountain, (2) North Carpathian Mountain, (3) Eastern Carpathian Mountain, (4) Southern Carpathian Mountains. 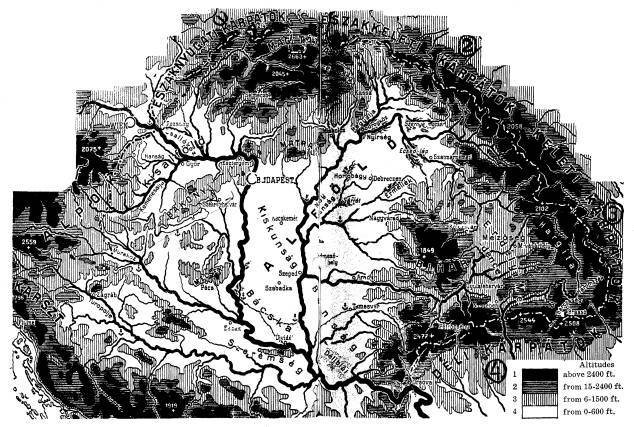 In the center (lowland) the two great rivers, the Danube (left) and the Tisza (right), together with their numerous tributaries, furnished pre-war Hungary with sea food and water power. In the mountains were built the flood prevention systems, adequately safeguarding life and property from the danger of flood. The center part of the country (lowland) furnished the cereal food, vegetables and fruits for the sustenance of the people of the country, while the mountainous regions supplied iron ore, coal, gold, silver, lumber, grazing land and table salt. European geographers claim that pre-war Hungary was a perfect geographical, territorial and economic entity. This baby is not dead, just starved as a result of the Treaty of Trianon. Underfeeding and malnutrition resulted in its emaciation. What a crime, when God has given the world all the food it needs! 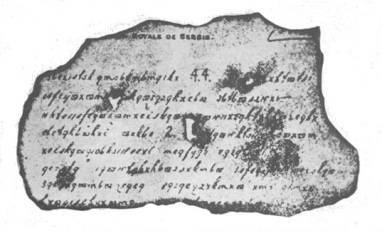 Code letter, ordering payment for the assassination of the Archduke of Austria. Originally printed in "John Bull," London, England. Shaded area represents the territories taken from Hungary by the Treaty of Trianon. The circles indicate the coal, oil and gas fields taken from Hungary. The white area indicates the territory left for Hungary. The French army of occupation in the Ruhr Valley practiced "democracy" by resorting to savagery and brutality. 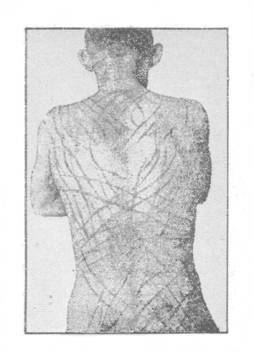 On the back of this German 72 welts, averaging 74 centimeters were counted by the attending physician. 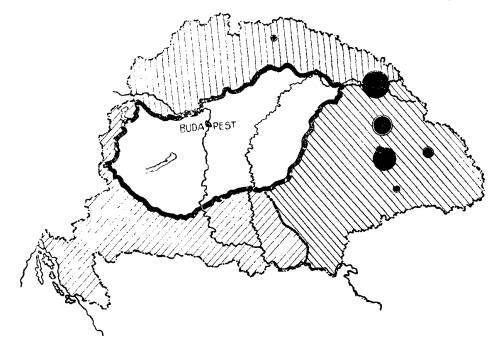 The flood-controlling systems of pre-war Hungary were built on the upper-parts of the rivers. In the Treaty of Trianon those parts of Hungary in which the flood-controlling systems were built were given to Czechoslovakia and Roumania, rendering mutilated Hungary defenseless against floods. 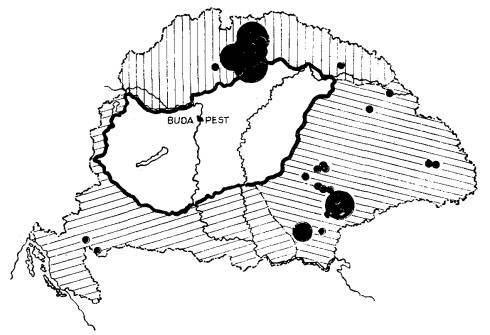 Shaded area indicates the territory in mutilated Hungary, depending for safety upon the flood prevention systems that had been built by Hungary before the World War in the mountainous sections of the country. Those parts of the rivers where the flood prevention system had been built were given to Czechoslovakia and Roumania, leaving mutilated Hungary at the mercy of those countries. This is equivalent to a sentence of death to the Hungarians by drowning. Since her mutilation Hungary had experienced several floods, against which she was helpless. Shaded areas indicate the territories taken from Hungary by the Treaty of Trianon. White area indicates the territory left for Hungary. The black circles indicate all the table salt deposit taken from Hungary and given to Roumania. The territory given to Roumania is known as Transylvania, which had been an integral part of Hungary for the past 1,000 years. The Unitarian Church was born in Transylvania, and the first law in Europe, giving the people freedom of religion and liberty of conscience, was enacted by the Hungarians in Transylvania. It is the most important outpost of Christian civilization. Both Catholicism and Protestantism suffered an irreparable loss when Transylvania was taken from Hungary. Without the return of Transylvania to Hungary, there will never be peace in Europe. 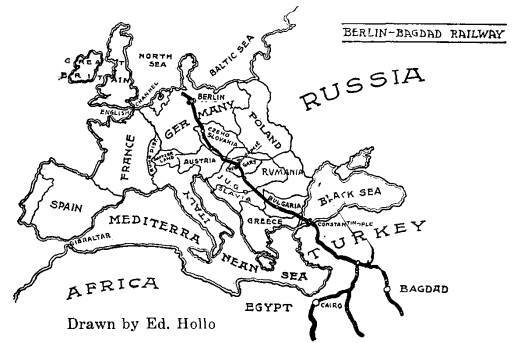 The Berlin-Bagdad Railroad. Draw a line from the Black Sea to the Mediterranean Sea. The point of intersection of the line with the Berlin-Bagdad Railroad was the point around which the World War was fought. 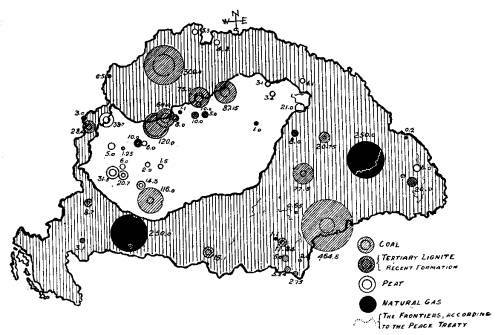 The black circles indicate the iron ore deposits taken from Hungary by the Treaty of Trianon. The white area indicates the territory left for Hungary. 99% of her iron ore deposits was taken from Hungary and only 1% was left. Budapest, Capital of Hungary, is the natural center of the railroad system of Middle Europe. 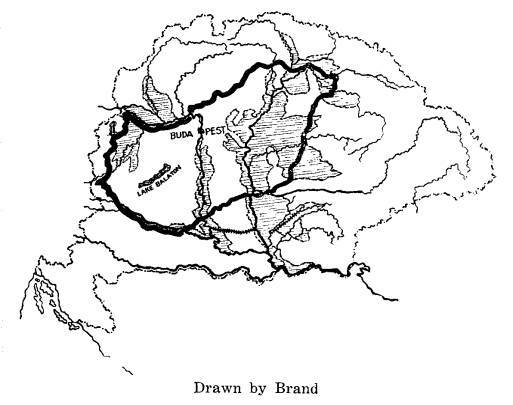 The railroad lines of the Berlin-Bagdad railroad system, running from Berlin, from London, through Belgium, from the Balkans, Poland, Russia and Italy, all unite at Budapest. 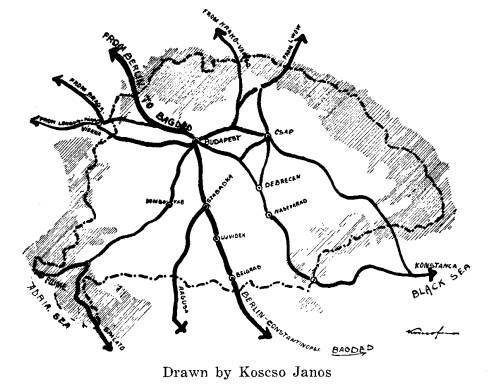 The mutilation of Hungary rendered the transportation system of Middle Europe chaotic. The future of Europe and world peace depends upon the correction and elimination of this chaos.